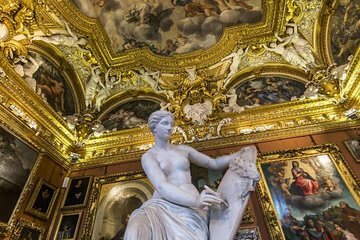 Visit Pitti Palace in Florence for a tour of its Palatine Gallery, a collection of private rooms and chambers that were once used by the grand dukes of the Medici family. Home to a wealth of Renaissance and baroque paintings, the gallery is fascinating to explore. Let an art-historian guide show you its highlights, and discover the showpieces of the Planetary Rooms along with works by Raphael, Titian, and Rubens. The tour was very professional and reliable. A rep and the tour guide were friendly and on time. Rosa was out tour guide and I felt like a family member was taking us around. She is exceptionally knowledgeable and experienced. The Pitti Palance is beautiful and worth the visit, especially this way because we had an interesting tour and didn’t have to wait on line. I highly recommend doing it! We had a great tour operator who really knew her stuff. She really brought this museum and all its history to life for us.